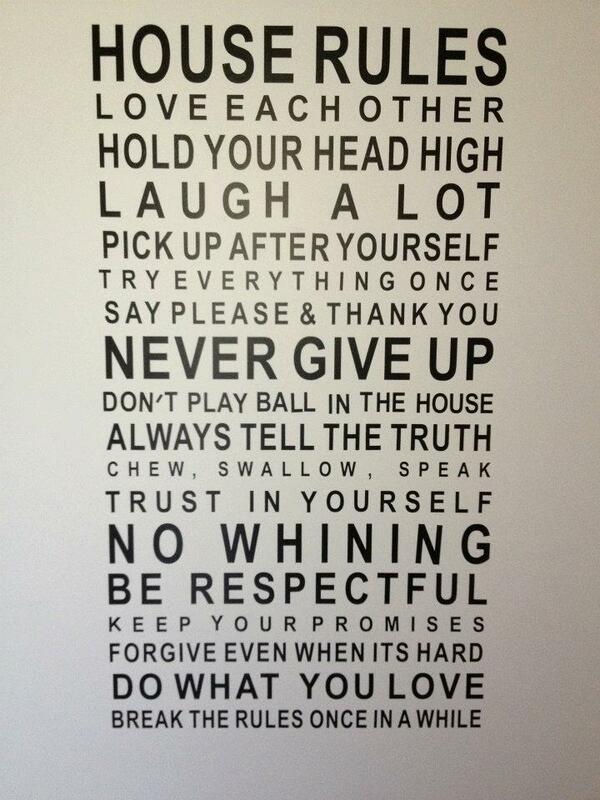 The first thing you’ll see as you enter our home is our house rules. Literally, as they’re stuck to the wall as you enter. I loved it as soon as I saw it & following Seon’s agreement it was bought & delivered within a few days. We had been looking for something to go on our wall as you enter our home for years. I wasn’t sure about a painting & we never saw one we loved & had to have, so the wall remained blank & the search for something to go there halted. Until I saw this. Each line means something to me. Each line is important. The rules are short but have so much meaning. It goes to show you that you don’t need a lot of words in order for the message to be understood. And also, that you don’t need a lot of words to get your message though or your point across! The house rules are not written specifically to anyone, but to everyone – whether you live here or not. It is relevant to Seon, me, Orli & one day Flynn too (although he can do with the no ‘whining rule’ at times). If you don’t live here you can still follow the rules. When you’re a visitor in our home feel free to follow the rules, & if you want, take some of these rules with you. As I continue my journey of self-discovery, embracing & sometimes – & let’s be honest – enduring motherhood, these little rules remind me what kind of person & mother I would like to be. It reminds me of the values I wish to instill into our children. 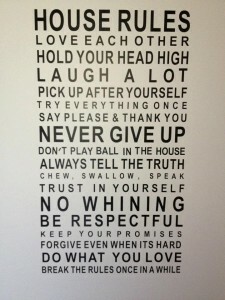 It reminds me to uphold these rules so that our children see them in action. It reminds me to be a good example to our children. It reminds me to be a good wife. It reminds me to be a good person. Each time I step into our home I am greeted by these messages & I love that I am constantly reminded of these values & messages. The last line sums it up for me – in this house we strive for respect, love, sharing, caring, but hell knows it’s not always sustainable, manageable or possible. After all, we’re only human!